Finland's role in World War II is examined in documentary, War and Peace of Mind, from writer-director Ari Matikainen. Whilst the documentary touches on some intelligent and little-discussed concepts in its final act, the bulk of it addresses ideas and information that has had countless exposure within the medium beforehand. Initially War and Peace of Mind centres on life in Finland during World War II and in doing so assembles archive footage, art-house visuals and a mix of talking head interviews. However, the most intriguing narrative device is the use of soldier's letters from the trenches - a somewhat effective method at capturing conditions on the firing lines. However, this blend of styles can often become jarring and disjointed with no real timeline followed or coloration between narration and the images shown on screen. Whilst the archive footage is indeed emotive, it does not always feel relevant to the topics at hand. Whilst this tackles a concept and part of history that is undeniably important and should be remembered, discussions of life in a war-zone (particularly during WWII) have been discussed in thousands of documentaries, films and literary pieces. Therefore it is a challenge to detect a unique voice or point of view from War and Peace of Mind initially. 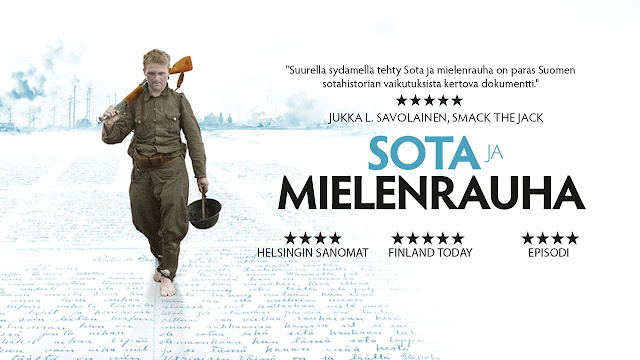 Matikainen's feature is at its strongest in its final act where it addresses Finland's direct role within World War II in a wider global context - particularly in its address of Finland's support of the Axis powers and the ultimate occupation/liberation by Russia. At its most interesting, War and Peace of Mind dips into the lingering guilt and effects that Finland's role during the war has on people today and how it shaped the further political landscape of the nation. However, this feels lightly touched upon in comparison to the focus that wartime life gets. In this final act, Matikainen gives more of a focus to talking head experts which proves a beneficial move in ensuring clarity and focus - subsequently making the documentary more engaging viewing. War and Peace of Mind is at its least engaging when presenting loose war-zone footage without clear narrative focus, however when it extends its gaze to cover Finland's role in a global context and the subsequent national sentiment it becomes interesting, more focused viewing.